Over three years, the number of public Israeli-Arab teachers has jumped from 420 to 588 - though not everyone is applauding the achievement. 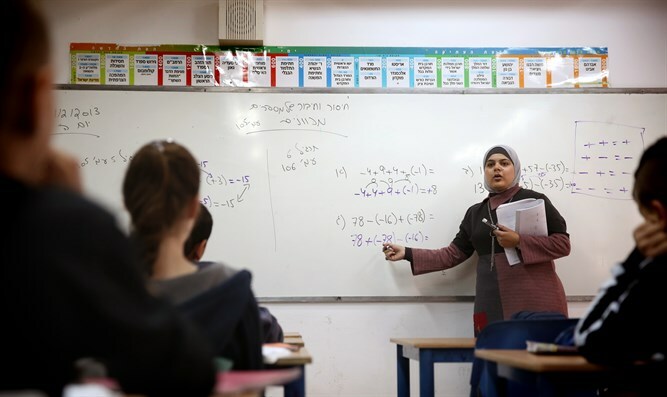 The number of Israeli-Arabs teaching in Jewish state schools has leaped by nearly 40 percent over recent years, reported Walla on Monday. Just three years ago, some 420 Israeli-Arab teachers were employed in Jewish public schools. In the 2014-15 school year, that number rose to 588, thanks to an initiative by the Education Ministry to integrate more Arab teachers into English, mathematics, and science programs around the country. The program, launched in 2013, is run jointly by the Education Ministry's Teaching Personnel Department and the Merchavim Institute for the Advancement of Shared Citizenship in Israel. Despite the rising numbers of Arab teachers in the three central subjects - up 76 percent - not everyone is happy with the change. A Walla poll published three months ago indicated that 21 percent of Jewish parents are against having an Arab teacher for their children. 30 percent of parents would prefer a Christian Arab over a Muslim Arab teacher, 40 percent said they would be satisfied with a teacher of either religion - and only one percent would prefer a Muslim teacher. Speaking to Israel Hayom, Eyal Ram, who heads the Education Ministry's Teaching Personnel Department, said the integration program offers "an opportunity for a shared life and coexistence among the two sectors, [offering] a viable solution for the surplus of teachers among the Arab sector and for the shortage of English, math and science teachers among the Jewish sector." Arab teachers for Arabic language classes in public schools also increased by 40 percent from 2013 to 2016, though it is unclear whether, or how many, more students are learning Arabic in recent years.